That’s quite a mouthful isn’t it? 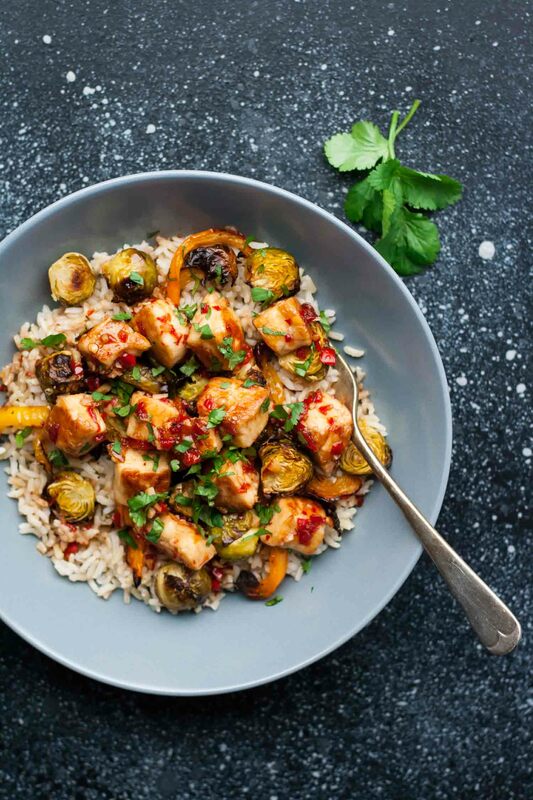 Sweet Chilli Halloumi Brussels Sprout Bowls. Thing is, I just didn’t really know how else to describe it. Anyway, the most important thing you need to know – it’s delicious. This is some real comfort food right here. I know many of you are probably headlong into some January healthy eating thing and that’s cool. But for me, at this time of year, I’m craving cosy bowls of comfort food. So I wouldn’t exactly call this dish healthy. 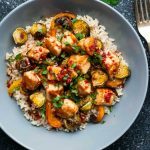 I mean, it starts out well, with hearty brown rice and roasted veggies but then we’re topping it off with cheese coated in a sticky and spicy sweet chilli sauce. Shall we call it balance? It’s January and it’s cold. That’s my story and I’m sticking with it. You can make this as mild or as spicy as you like. I’ve made it a few times over the past few weeks and the first time it had the perfect level of heat. The second time, my chilli wasn’t very hot so it wasn’t spicy enough and so I made a mental note to increase it next time. And when I made it to take these photos, I nearly blew our faces off it was so spicy! That’ll teach me to double the amount of chilli without even testing how hot it was! A glass of milk later and all was well again, but I would definitely tread carefully with the chilli here! This is the perfect meal to whip up after you’ve come home from a long day at work as it takes barely any time to prepare and it’s JUST. SO. GOOD. Who wouldn’t want to eat a bowlful of spicy fried cheese at the end of a hard day at work? Ok, not quite a bowlful. Just a smattering over the top of some genuinely wholesome ingredients. Now that’s a dinner win in my book. 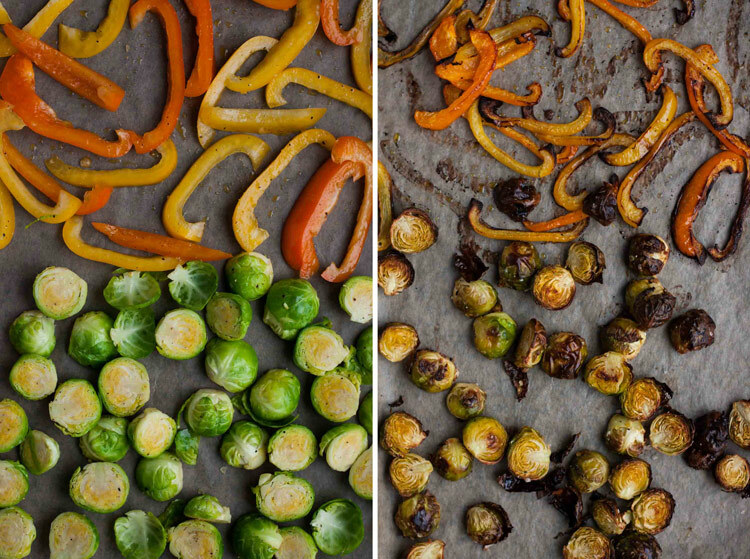 You can use whichever roasted vegetables you like here but please don’t skip the brussels sprouts! 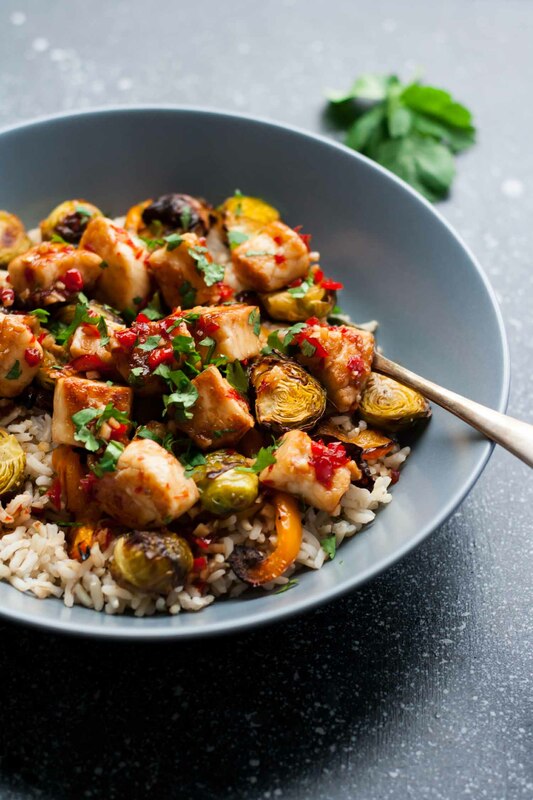 I didn’t (ever so eloquently) call these Sweet Chilli Halloumi Brussels Sprout Bowls for nothing! The brussels sprouts are non-negotiable. Seriously, once roasted, brussels sprouts turn all nutty and caramelised and downright incredible so don’t skip them even if you think you hate them! Just look at them up there, all burnished and bronze. They’re basically crisps! They taste so addictively good with the sweet chilli sauce and the chewy salty halloumi. These bowls have got it all. You must try! 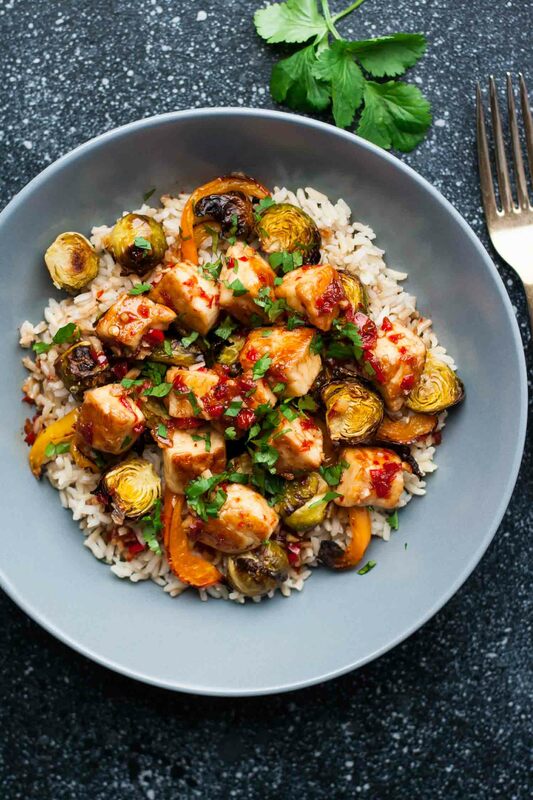 And if you’re looking for some lighter comfort food, check out my Baked Chipotle Salmon Freekeh Bowls, Crispy Tofu Black Rice Bowls or my Autumn Nourish Bowls with Roasted Swede. Place the brussels sprouts and halloumi onto a baking sheet. Drizzle with 1 tablespoon rapeseed or olive oil and season to taste with salt and pepper. Toss well to mix. Place in oven and cook for 25-30 minutes until browned and crisp around the edges. Heat a little oil in a frying pan. Add the halloumi cubes and fry until browned all over. This should take about 5 minutes. Remove and set aside. In a small bowl, whisk together the chopped chillies, garlic, vinegar, honey, soy sauce and sesame oil. Pour into the hot frying pan and bring to the boil. Cook rapidly for about 2-3 minutes, until starting to thicken and reduce. Add back the halloumi and cook for a further 2-3 minutes until the cheese is nicely coated but you still have a pourable sauce. Divide the brown rice between 4 bowls and serve up the roasted veggies on top. Top with the halloumi and sweet chilli sauce and serve immediately. *depending on how hot your chillies are and your own personal tolerance to spice. **use any vinegar you like. I've used both white and red wine vinegar to delicious effect. Apple cider or rice vinegar are both good choices too. I'd draw the line at malt vinegar though! Thanks Hana! Cosy comfort food is the best! Oh yum, these sound amazing, and so unique!!! I LOVE anything to do with haloumi, so I will be trying these out soon for sure. Thanks so much Donna! Yes, halloumi is the best! Hope you love these! Oh yum! Comfort food in this cold and long January! Love the flavors going on here, Sasha! And it looks beautiful and colorful, too, which is good, since we eat with our eyes, first 🙂 . I love this new spin on Brussels sprouts! This is my kind of meal! Hi Carol! Thanks so much – it’s a great comfort food meal!